This recipe is simple, easy and delicious. It’s a dream on planked salmon, but it also works well on chicken pieces for shish kebab. Everyone I know who has tasted this marinade has loved it. I convinced my brother in law, who absolutely hates fish, to try this marinaded planked salmon. He not only loved the taste, but is now going to start eating salmon. The only catch with this recipe is that it really needs an overnight head start. The final result is a salmon that has layers of savoury flavours and the smoky richness of the cedar. A nice fresh salmon steak; sockeye salmon is ideal. Leave the skin on. 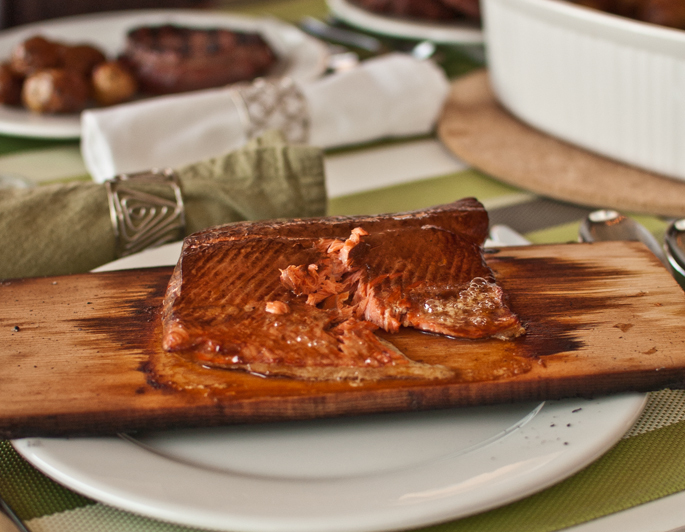 A food-grade cedar plank large enough to hold the salmon; a little bit of extra room is perfect. Many hardware stores stock these in 1 foot lengths. Red wine vinegar (balsamic mixed with apple cider vinegar also works well). A glass or plastic container large enough to hold the salmon steak and with room for it to be completely covered by the marinade. One that matches the proportions of your steak is best so you don’t have to make more of the marinade than you need to. A container that you can use for soaking your plank. You want your salmon to soak in the marinade for around 24 hours before your barbecue – it really makes a difference. I have tried this for 6 – 7 hours, and the results are not as nearly as satisfying. Combine the sesame oil, soy sauce and red vinegar in your marinading container. The proportions will be 1/3 of each. Make sure you will have more than enough to completely cover the salmon steak. I generally start with about 1/2 cup of each. Before you add the salmon to the marinade, mix vigorously and give it a taste. If you feel it needs more soy or vinegar, add a bit more. The flavours should balance nicely so you get the low notes of sesame, the salty savouriness of the soy sauce, and the acidic tang of the vinegar in succession. Gently add the salmon the the container of marinade. If it’s not completely covered, mix some more and add. It’s crucial that the whole salmon is covered. Refrigerate the marinading salmon – it is dangerous to leave it out on your counter. Several hours before you want to start barbecueing, soak your cedar plank in water. I like to make sure that it gets at least 4 – 5 hours to ensure it is saturated all the way through. Make sure the plank stays soaked right until the moment you put it on the barbecue. I use a large freezer bag filled with warm water, remove the air, and leave the whole thing on a cookie sheet in case of leaks. Set your barbecue to a medium-high flame, and preheat. Put the cedar plank on the grill. Gently remove the salmon from the marinade and put on the plank. Allow to cook until the centre of the salmon is cooked – I generally end up cooking for around 12 – 15 minutes. The blank will burn, especially on the underside, but that’s not a problem. Once you’re sure the centre of the fish is cooked, go ahead and serve. Don’t worry about removing the skin – it will be tender enough to eat. Because the salmon is so tender and flaky and prone to falling apart, I usually just serve the fish on the plank. For a more refined presentation, use a spatula to plate the fish.